I am having a merry ol’ time with my Christmas Postcard Advent Wall, so much so that I am inventing yet another way to enjoy my 100 year old holiday greetings. Starting with today’s post I will share a different card each day until Christmas. The focus will shift from treasure to treasure as some cards are noteworthy for their family history, some for their postage marks, some for their publishing details. On the first day of the Postcard Advent Calendar, I reveal a Santa! Santa Claus is among the most common images in this collection. This 1908 embossed Santa postcard was produced by Julius Bien and Company, a publishing house that I believe was located in New York. Julius Bien was a European-trained lithographer and map engraver whose company produced state atlases, maps and obviously holiday postcards as well. There is no citation as to where this card was printed, but the message within the “stamp spot” states that postage within Domestic Canada, Great Britain and Germany was One Cent, whereas foreign use required Two Cents. Perhaps it was actually published in Germany, as were so many of this era’s postcards. Dear Donald–Wishing you a very merry christmas and a Happy New Year. from your cousin Leora B.
Leora Black was the daughter of Eva Stevenson Black, the sister of May Laura Stevenson Minor, my grandfather’s mom. Born in 1897 Leora communicated with her younger cousin (b. 1902) quite frequently as evidenced by the many cards I am finding in this collection. 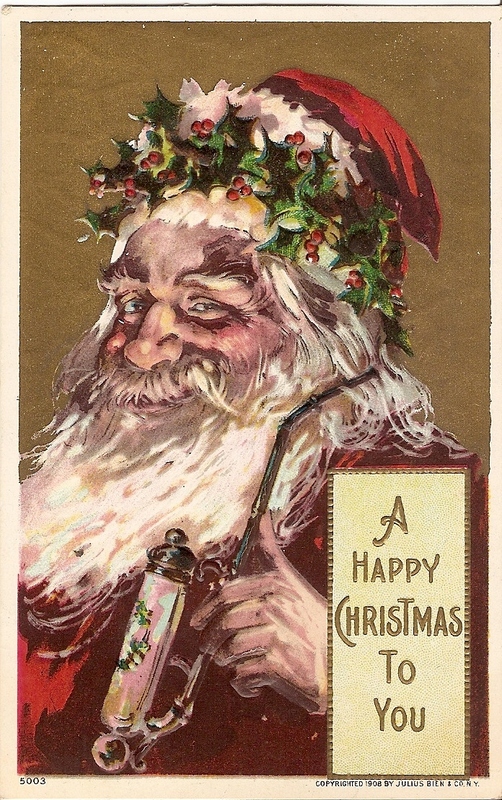 The pipe this Santa is holding fascinates me, but its significance has stumped me. The inspiration for Santa images has been drawn from the poem “Twas the Night Before Christmas” since the mid-1800s, and this postcard seems to follow the illustration directives until you notice what Santa is holding. A stump of a pipe this clearly is not! Readers, collectors, help! What are we looking at here? I look forward to hearing your ideas! Update: A reader comment led me to the Tobacco Collection, which discusses in depth the era’s German pipes. Transfer printing techniques made painted porcelain bowls affordable for the masses. People bought pipes ornamented with regimental coats of arms, and portraits of family or famous people. Pipes were also painted with ornamental motifs particular to one’s occupation, as in this case, where Santa has his pipe painted with Christmas holly.